March 2015 marks my one year anniversary of #BrokeAndCooking! I have learned so much and have had so much fun developing recipes to share with you all. I appreciate every reader who has ever taken the time to read, share, or even try these recipes. I wanted to share something fun for my lil anniversary, and naturally, sweets came to mind, but I have some fun dessert recipes coming up in April so we’ll wait :) I finally decided to share a nice, homey chicken dish because it seems to be some of my favorite things to cook. I think it’s great to have a huge arsenal of quick and yummy weeknight dinners. So here’s another one, my Cilantro Lime Chicken. 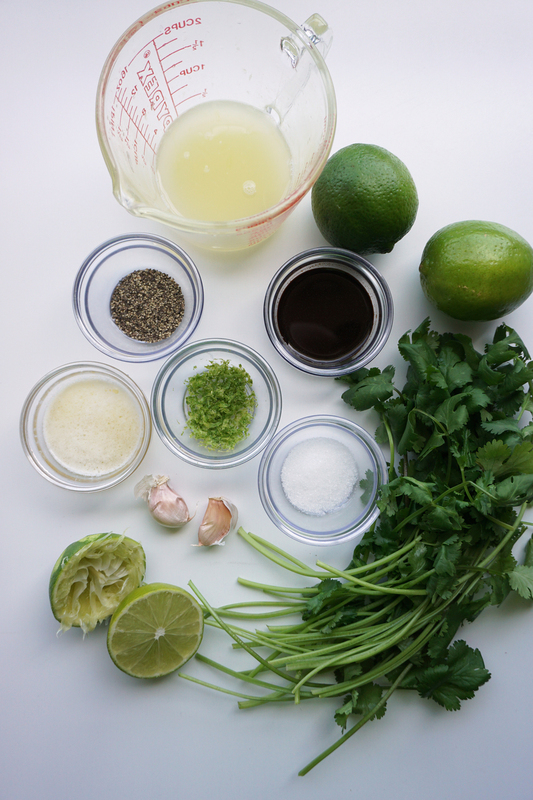 This marinade is made of ingredients that are super affordable, and often, all you need to head to the store for is for fresh limes and cilantro. Limes are often on sale at produce markets for fairly cheap prices - my favorite local produce store has limes on sale 10 for $2! You can use this marinade on any cut of chicken - breasts, thighs, or drumsticks. I prefer thighs, even though breasts are healthier and have more protein. If you’re just starting to play with different chicken recipes, I’d suggest cooking up some chicken thighs! You can hardly mess them up :) So let’s get cookin, this one’s a fun one. Mince two garlic cloves and put aside. Juice 1-2 limes for ½ cup of lime juice. Whisk together the salt, pepper, Worcestershire sauce, garlic, and lime juice. Whisk in the honey and cumin. Place all your chicken into a gallon baggie. Once your marinade is combined, pour it over the chicken. Zip the top and massage the chicken, making sure the chicken is well coated. Let it sit in the fridge for at least 30 minutes to a few hours. I found that an hour an a half was sufficient in a time crunch! Overnight may be too long because the acid will start to cook the meat. After your chicken has marinaded, lightly spray a baking sheet with cooking spray and use a slotted spoon to fish out your chicken. Arrange them in a single layer on the baking sheet, making sure to give them room. Lightly brush the tops of the chicken with the melted butter, and season them again with salt and pepper. Bake the chicken thighs for about 20 minutes, or until they reach 165F internal temp and the juices run clear. The bake time will vary depending on the size and cut of your chicken. However, if you use a meat thermometer, which I swear by, once the internal temp reaches 165F, you'll have perfectly cooked chicken. Garnish with the fresh lime zest, chopped cilantro, and slices of lime. It’s delicious over hearty brown rice or a crispy romaine salad. I love how easy this dish is - once you toss the marinade together, it’s basically done! Place all your chicken into a gallon baggie. Once your marinade is combined, pour it over the chicken. Zip the top and massage the chicken, making sure the chicken is well coated. Let it sit in the fridge for at least 30 minutes to overnight. I found that an hour an a half was sufficient in a time crunch! I love how vibrant this dish is! The flavor matches how fun it looks :) The addition of cumin gives this chicken a really unique twist. This dish has become a staple in my household. I love it because I generally have all the ingredients for the marinade in my pantry already. I hope you give it a try - and if you do, shoot me a message, tweet, or even a picture! I love hearing from you guys and appreciate every single reader :D Have a great week! !